Here's a short screenshot of something I've started messing about with on the TI-84+CSE. It's a block-by-block pseudo 3D engine (facing either east/north/west/south). It's still very early stages - I haven't finished drawing some of the distant wall tiles, and I've still got to do proper textured tiles for the walls. However the screenshot shows some basic rendering and navigation (the values shown at the bottom are x,y,direction). At this stage it's on the TI-84+CSE, but it will probably be for the newer "CE" (and possibly the "CSE" as well if speed permits). Oh, wow, this is really impressive! For some reason, when I first read this topic, I thought that you were writing this in Hybrid BASIC with xLIBC, probably because of the half-resolution graphics, but I now see that it is in fact assembly. It sure seemed too fast even for optimized Hybrid BASIC. At any rate, I wish you the best of luck with it, and it's hard to believe how far you've gotten on this having just released Alien Breed. I should warn you that we don't yet have a guarantee that it will be possible to directly access things like the LCD's ports or if the LCD has a half-resolution mode yet, so don't get too carried away with TI-84+CE programming plans yet. This looks awesome! How are you planning to handle texturing? Haha, that's pretty sweet. 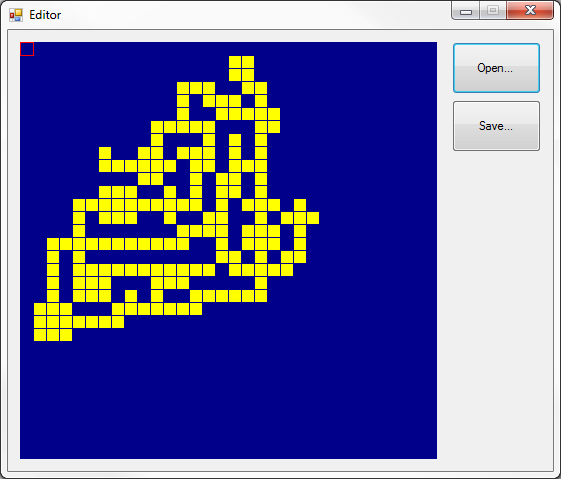 Does the renderer work by selecting the correct tile and then displaying it based on the 2D map? Theoretically then, the textures could be anything you want. This reminds me greatly of a Basic Doom port for the monochromes right now. I can't wait to see what this progresses in to! Nice work on getting this done so quickly to! Thanks! I've had this idea in mind and been brainstorming it for a few months, so my brain kind of had a head start. But I promised myself I wouldn't start any coding until AB5 v2 was finished Very true about the TI-84+CE - in any case when I first thought about this project the CE wasn't even announced yet. If there's no half-resolution on the CE, I'll be trying to do it in full res - hopefully the faster speed makes it feasible! Hah yeah many, many years ago I released a version of Alien Breed 3D in BASIC that used a very simple pseudo-3D engine (screenshot below). This 84+CSE engine renders by working out which direction the player (party) is facing, then drawing walls 3 rows away, then 2 rows away, 1 row away, and next to the party as necessary (so further away walls are drawn over by closer walls). A simple but not really efficient technique that works at fixed 90 degree multiples. I have considered trying ray tracing though to see if it renders more efficiently or in a better looking fashion, and also without having to store so many textures. As I said anyway, still very early days, this is just the product of bits of free time over the last few days. Alien Breed "3D" back in 1999! Bit of an update - I've spent the last couple of days converting some of the original EOB wall textures, as well as putting in basic ceiling/far distance/floor. That is so cool. The wall textures make it look so much better. I wrote a quick map editor, added in the ceiling and floor textures and implemented side sliding/strafing. Whoa, that was fast! Nice work James! Very impressed. As for textures, I wouldn't worry too much about space. Even if it has a few pages, you have a ton of archive room to work with. Good luck! Very true - I've decided I will be having alternating floor/ceiling textures as you walk along, etc. I just need to spend the time converting the alternate version. I've got a bit of storyline coming together as well. Whilst I don't want to bog down the gameplay with massive amounts of text every few minutes, I'm currently thinking there will be bits of exposition during the game, whether it's via scrolls or something that are collected along the way, or from NPCs, etc. One thing that might be an idea is to have 2 sets of ceiling/floor textures, so that when you turn, it will change so that the pattern of the bricks/ground will change depending on the direction. This might cause some slowdown however? Eye of the Beholder is one of the major influences on me doing this engine (and hopefully eventually full game), along with Knightmare for Amiga and the boardgame HeroQuest. Those wall textures look really fantastic! The inventory/character panels look really great! Ths is amazing! I love the look of the walls, and the inventory is something very cool. Why is there four HP slots, will there be helpers in the game? Why is there four HP slots, will there be helpers in the game? Oh, ok, could link play be implemented at one point? There are 282 users online: 7 members and 275 guests. © Copyright 2000-2019 Cemetech & Christopher Mitchell :: Page Execution Time: 0.249180 seconds.